World Cup Begins Without The U.S. Men's Team For the first time since 1986, the U.S. men didn't qualify. Officials say they are focused on getting the team back on the World Cup stage in four years. 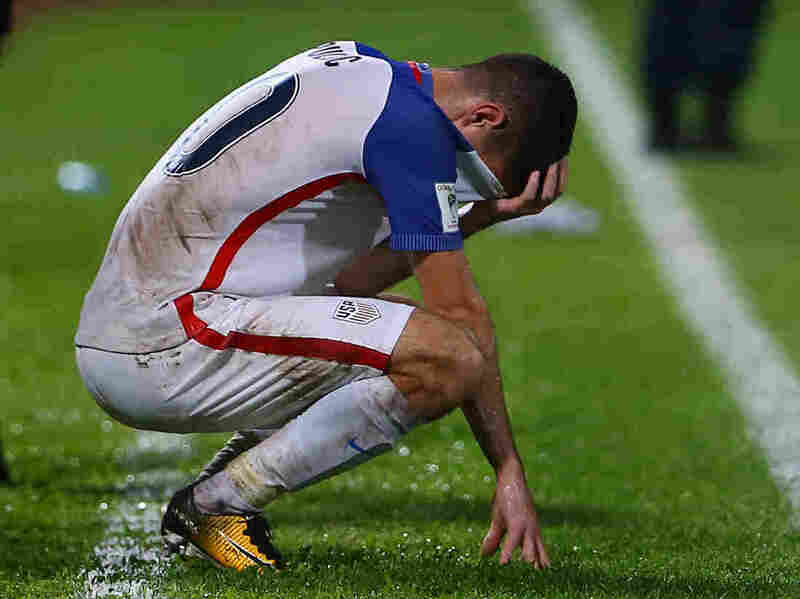 Christian Pulisic of the U.S. Men's team reacts to his team's loss to Trinidad and Tobago last October. It's been eight months since the disastrous match where Trinidad and Tobago beat the U.S., knocking the Americans out of the World Cup. Nineteen-year-old Christian Pulisic, a star midfielder for the U.S., played that night. He still laments he'll be watching the World Cup rather than competing. "You know [it's] sad, obviously," Pulisic said. "We'd like to do it [play in the tournament] but now we're just working on developing this team and being ready to qualify for the next one." Pulisic was part of this team that took the field two weeks ago in a Memorial Day friendly against a national team from Bolivia. The game was in Chester, Pa. and more than 11,000 fans were there. So were top U.S. Soccer officials, like Nico Romeijn. As chief sport development officer, Romeijn oversees five departments in the Federation, including youth national teams and talent identification. Asked whether missing this World Cup means there's a crisis in men's soccer, Romeijn said "no, [that's] too strong." United States fans cheer during an international friendly soccer match against Bolivia last month in Chester, Pa.
Not qualifying, of course, was a "big disappointment." And Romeijn says it gave urgency to work already underway. For instance, work on coaching education. "It's so important to improve the level of coaching all over the U.S.," says Romeijn, adding "not only when you're looking at the highest levels, but also when you're looking at grassroots. Because it's all connected to each other." Romeijn says youth development continues as well, with recent signs of success. The U.S. made it to the quarterfinals last year at both the Under-17 and Under-20 World Cups. 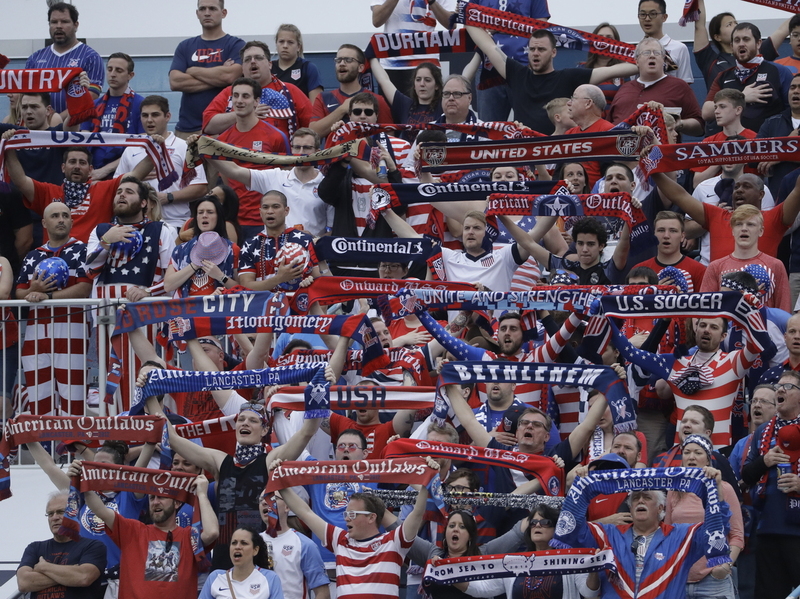 U.S. Soccer may be keeping calm and carrying on. But it can't ignore the fractures in the men's national team that contributed to the qualifying debacle. Fractures caused by coaching controversies and the harsh criticism that followed the Trinidad and Tobago upset. The Federation has responded by adding new personnel. Last week U.S. Soccer hired former player Earnie Stewart as the first-ever general manager of the men's team. In February, U.S. Soccer elected a new president. Former national team player and current NBC soccer analyst Kyle Martino ran for president of U.S. Soccer, but lost. Still, Martino continues to share his campaign calls for reform. Starting with the U.S. Soccer culture. "There's a culture of patronage," says Martino. "It's become incredibly insular [with] a handful of people that don't have the technical qualifications or the history as a player to grow the game and create macro architecture that can help not only develop players but improve the quality of experience within the sport." "[U.S. Soccer] hasn't become the meritocracy it should be," Martino continues, "where the qualified people who are in it for the right reasons rise to positions where they have the authority to, in a democratic way, make great decisions for soccer in this country." Despite his criticism, Martino says he's rooting for new U.S. Soccer President Carlos Cordeiro. "I hope he does a great job," says Martino. I hope [he pushes] the reform that's necessary to change the culture within U.S. Soccer and bring this game to a larger amount of people who've found it hard to either participate or stay in the U.S. Soccer family for a long time." Martino's particularly passionate about the idea of spreading the game. As the new board chairman of Street Soccer USA, a non-profit working to grow the game in inner city communities, Martino wants U.S. Soccer to cast a wider net at the youth levels of the sport – as part of a broader search for the next generation of national team players. It's the most diverse and non-discriminatory game in the planet. And in our country it's a rich kid's game. "You have to create the architecture so that it's inclusive," he says. "This is a blue collar sport everywhere else in the world. The teams that win World Cups, that list is made up of kids from favelas in Brazil and the streets of Buenos Aires. That's where the game lives. It's the most diverse and non-discriminatory game in the planet. And in our country it's a rich kid's game. Fixing that absolutely will improve our national team." At the game in Chester, fans were happy for a night. The U.S. beat Bolivia and two 18-year-olds were stars. Josh Sargent and Tim Weah both scored. Sargent made his national team debut. "I was very nervous to be honest," Sargent said. "It was my first professional game ever, so it was a pretty big deal to me and I was proud to net one." After Pennsylvania, the U.S. went overseas and lost to Ireland and then tied World Cup-bound France. The friendlies perhaps offered a hopeful glimpse of the future. Now that the 2026 World Cup is coming to North America, qualifying for that event, at least, may not be an issue since there's a good chance the U.S. will automatically qualify since it's the principal host. But new Federation President Carlos Cordeiro has the kind of big plans that might help the U.S. avoid other World Cup qualifying embarrassments for years to come. "We believe this event [the 2026 World Cup] will become a lightning rod," Cordeiro said Wednesday, after the U.S., Canada and Mexico won the bid. "It will become transformational for the sport as kids that're now 8, 10, 12 years old can all dream of potentially playing for a national team." "I make the argument," Cordeiro continued, "that we are a vast, powerful, wealthy nation, but we have haves and have-nots. And our disenfranchised are underserved, and in many ways these are the people with whom the sport resonates most. We don't have enough of them – at 3.5, 4 million registered kids [in U.S. Soccer], we believe there are many, many more who could be playing with us." It's a message of inclusion that should give hope to critics — that with the right people making the right decisions, the U.S. finally can realize its potential in men's soccer.